What I love about this dish is that you can make the meatballs in bulk and store them in the freezer and just take out some when you need it. The sauce or gravy is super simple and easy to make, no prep needed except for the cheese, but you can just directly grate that over the sauce while you’re cooking it. I like to use plain yogurt in place of sour cream to make it healthier. Serve it over cooked pasta and you have your self and your family a hearty yummy meal that didn’t take a long time to make. pour sauce over cooked meatballs.. Combine all ingredients for the meatballs, using a scale, weigh meatballs into 1-ounce portions and place on a sheet pan or just eye ball it like what I usually do. Wet your hands and, shape the meatballs into rounds. Heat a little oil in the skillet or frying pan and add the meatballs and saute until golden brown on all sides, about 7 to 10 minutes. Remove the meatballs and cover to keep it warm or place meatballs in the warmed oven. Set aside while you make the sauce. Using the same pan, discard excess oil ( there's going to be a lot of oil in there if you did not use lean meat) and just leave about two tablespoons; lower the heat and add the flour to the pan or skillet. Whisk until lightly browned, approximately 1 to 2 minutes. Gradually add the water or beef stock and whisk until sauce begins to thicken; add the dried parsley, if using. Add in the grated cheese and continue to cook until the cheese is melted then pour in the yogurt and just heat through. Tip: Before you shape the meatballs, test the seasoning first by frying a little of the meat mixture, if you're satisfied then go ahead and shape everything into rounds; keep the extra meatballs in the freezer for later use. Just double or triple the recipe for the meatballs if you want to make it in bulk, it's a great way to save cooking time. 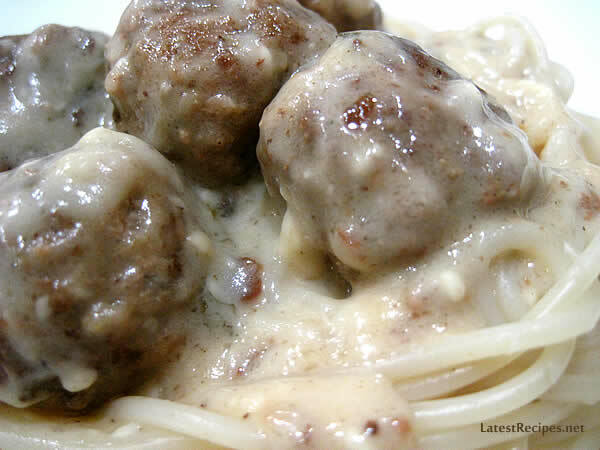 3 Responses to "Swedish Meatballs with Yogurt-Cheese Sauce"
Yummy indeed! Love the fact that it’s healthier, my boys would love this! This looks good! Swedish meatballs in IKEA is one of my favorite comfort food!